Interiors is one of the fastest growing Interior Designing & Architectural firms of India. 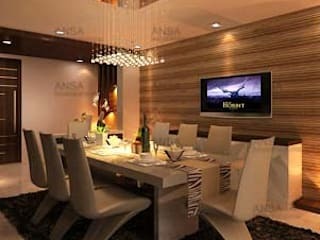 Established in 2003, Ansa is a responsible, responsive and customer friendly organization which brings to you world class interior designs, turning your dreams into reality by providing classy designing, specialized consultancy & effective supervision. Be it residential or commercial projects, Ansa promises ultimate satisfaction through a complete range of interior design services, including Space Planning, Decorating, Renovation and New Construction. 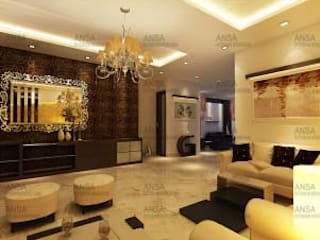 Ansa was started by the very skilled designer duo Ankush and Sapna Aggarwal with a vision of giving life to the dreams that people have about their homes or offices. Each project is focused and unique - a balance of aesthetics, functionality, ergonomics and economics to suit personal taste. They assure that the new space reflects the unique personality, and not a standard. They create an element of unpredictability and add subtle details that spark interest, making you the proud owners, raising spirits and exuding life. The company’s strength is the creative and dexterous team of interior designers, decorators and consultants who work delicately on all places to come up with a set up which optimally utilizes the available space in the most aesthetic yet practical manner. Ansa is amongst the best Conceptual Designers Firms in today’s niche market who also acts as consultants to ensure that the customers get what they want. There services include making of customized layouts, supervising the site, and helping in purchase, ordering & overseeing budgets. They listen, understand and ultimately create a space that exceeds expectation. At Ansa the services are an amalgamation of - Designing, Consultancy and Supervision. Designing includes exquisite contemporary designs, from flooring to ceiling, wall elevations to furniture, and electrical to plumbing. Consultancy includes guidance regarding quality material and labor. Supervision is a service provided by Ansa for quality assurance while checking the work being executed properly on site, resulting in utmost client satisfaction. They provide specialized services for architects offering them raster to vector, drafting services for standardized technical drawings and they also have 2D CAD systems such as AutoCAD to replace the paper drawing discipline and provide services for 3 D views. A guest lecturer to JIMS to bridge up the gap between the students and the practical world. An external examiner in INIFD, Patel Nagar. We have been writing regularly for magazines like Society Interiors, Ideal Home and Garden, New Woman, India Today, And Persand, Horn Ok Please, Ping, Wedding Affairs, Perfect Woman, Better Homes, Fusion Life Inner and Sattva. Also anchored few shows for some leading news channels like Zee Business- Property Plus, Zee Business- Business Street, VIP News.